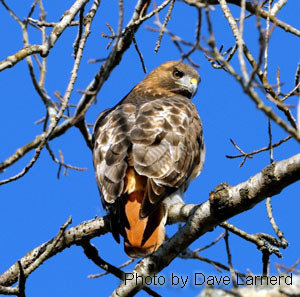 The Red Tailed hawk is probably the most common and well-known hawk in New York as well as all of North America. They can be seen flying over open fields or perched on tree limbs, telephone poles, or fence posts across the Empire State. TheseHawks are members of the raptor family, and are most recognizable for their broad, rounded, brick red colored tail. These raptors can grow to 25 inches long and weigh as much as 4 lbs., females being usually about 25% heavier than their male counterparts.Their bodies are brown in color with white breasts with a wingspan that can reach up to 4 feet. About 80-90% of a hawks diet consists of small mammals such as mice, squirrels, chipmunks, rabbits and even an occasional cat or two. Other prey can be snakes, turtles, frogs, small birds, grasshoppers, earthworms and fish. They have also been known to feed on roadkill and other carrion. RedTailed Hawks mate in the Spring where you will see them males and females diving and rolling in the sky, sometimes locked at the talons spiraling towards the ground just before separating. Nests are built by both the male and female in very tall trees with tree material... leaves, twigs, pine needles, and pieces of bark. Nests can be as high as 6 feet and 3 feet across and can take up to a week to build. There, the female will lay from 1-5 eggs that are white in color with brown spots. Both male and females will incubate the eggs for about 28-35 days, each hunting and feeding the other while they sit. Babies are born cover with a white down and stay in the nest for about six weeks, being fed by Mom & Dad, before learning to fly. The young fledglings will stick around for the summer watching and learning how to hunt and fend for themselves. But, it will be about 2-3 years before they are mature enough to find a mate and have young ones of their own. Average lifespan for these birds is 13-20 years. They tend to keep the same territories their whole lives. They have a crop, much like a turkey, a pouch halfway between the mouth and the stomach, where food is stored and gradually released to the stomach. Typical soaring and flying speed is 20-40 mph; however, in a dive when hunting, the birds can exceed 120 mph. It's only true natural predator is the great horned owl, which has been known to attack the hawk and it's nest, as well as compete for food. They are the most widely-used birds among falconers.